In an effort to appeal to a larger customer base, Shark came up with the idea of reducing the weight of the main flagship, the Powered Rotator. Thus, the Rotator Speed emerged, a great unit for people who need a fast and easy-to-use unit. This vacuum stand out of the crowd with a powerful suction, a decent filtration and last but not least, an accessible price. 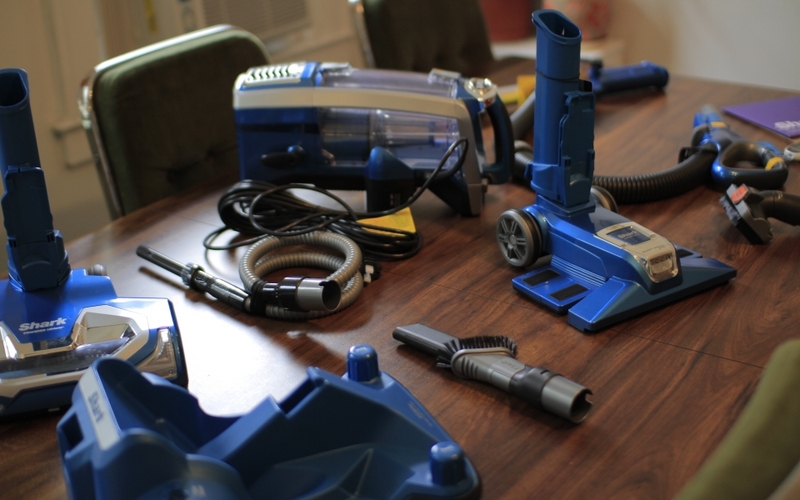 By the way, if you’re in a hurry and want to know more about all the Shark vacuum cleaners from this series, you can just skip this story and check out this comparison chart. Suction power It's not as powerful as the NV750, but then again, who needs so much suction? 180 AW is enough for my taste. Actually, the way I see it, the Speed is competing on the same market segment which Dyson tries to win with its Small Ball unit. However, the Dyson Small ball only vacuums with 150 AW. The Speed comes with 2 different heads, the standard one which includes a powerful brushroll and another nozzle specifically designed for bare floors, called the Dust-Away Hard Floor Attachment. Input power Since it has a lower suction, it also consumes less. It needs only 800W to work (as compared to the 1200W consumed by a NV75*). Its motor runs on 6.7 Amps. Dust capacity The dust cup has a capacity of 0.725 gallons, smaller than the standard Rotator, but still much bigger than the bins of other vacuum cleaners from its class. Based on this value, you can vacuum 2000 sq ft. before you have to empty the container. I've always appreciated Shark units for their spacey dust bins. Filtration system efficiency Shark tries to improve at this chapter, by deploying a completely sealed system and a HEPA filter to handle all the air output. Weight and Dimensions This represents one of the best points of this model. It weights 13.8 lbs. and measures 47.5" x 11" x 12". It is almost 2 lbs. lighter than the standard unit. Warranty Shark usually provides for Speed models a lengthy 7-year warranty. However, depending on your retailer, you may get it with a 5 year plan, or a lifetime warranty (if you purchase it directly from SharkClean.com). Accessories Most of the vacuum cleaners are packed with unwanted and obsolete accessories which go out of date or are just left here and there in the house. Whereas, the Shark Rotator Speed is presented to the customers with all new and usable accessories like the Duster Crevice tool, the Pet Multi-Tool, the Home and Car Detail Tool and of course, the caddy. Special features 2-in-1 vacuum cleaner - Transforms into a canister, if used with the caddy. Advanced swivel steering - It can be used with ease. Fingertip controls - This appliance can be controlled with only one hand on the vacuum handle. LED lights - great looking led lights on both nozzles. Usability The Shark Rotator Speed can be used to clean hard-to-reach sharp corners, ceilings, and that irritating pet fur caught up by your carpets. From unboxing, to vacuuming, it take only 5 minutes. The unit produces a medium sound. The width of the nozzle is not as big as the one from the standard Rotator. Price This is definitely not cheapest Shark on the market. It is for the moment available with a discount on Amazon.com. Or you make choose to take SharkClean.com's direct offer, which includes a car detailing kit and a steam pocket mop for $229. It comes up with the anti-allergen complete seal technology and HEPA. It is a 2-in-1 unit, meaning you can easily reach from floor to ceiling. Comes with LED lights, which help you to see hidden dust and dirt particles. It’s affordable for the middle class. For some, impractical to switch from one nozzle to the other. Some accessories, such as the detail kit, need to be purchased separately. It’s not the most reliable vacuum cleaner I’ve seen. As you see, this unit scores pretty good. Impressed? What’s your take on this? Would you buy a Shark Speed? Bought one already? Share it with us.